That can certainly be seen as true for Paramore. The band have had their ups and downs over the last couple of years, but now they’re back and better than ever. The reason? No matter who plays drums and guitar, Paramore is Hayley Williams. As she grows as a singer and songwriter, so too does the band grow from strength to strength. With this, the band’s self-titled fourth album, Paramore are making a fresh start. 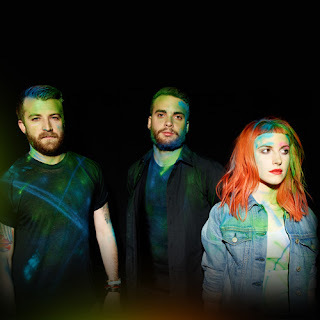 No longer are they an emo punk band with pop success, but a pop band who happen to make their music on guitars; no longer are they optimistic pessimists wallowing in misery business, instead they’re all grown up. With No Doubt being an obvious comparison and production coming from pop producer Justin Meldal-Johnsen (most recently working with Tegan & Sara and M83), the songs are catchier than ever. As track six declares, “ain’t it fun?”. The fun begins immediately with opener Fast In My Car – a giddy rush of a pop song as Williams sings “we’re driving fast in my car…tonight we want to have fun”. It’s also a song that acknowledges that the band have moved on: “we aren’t looking backward, we won’t try raising the dead”. ‘Paramore’ is a new beginning, a high-tempo adrenaline rush. It’s a theme that incessantly continues throughout the album, such as in the catchy chorus of Grow Up – “some of us have to grow up sometimes and so, if I have to, I’m gonna leave you behind”. Judging by the lyrics, current single Still Into You should be a sickly love song (like the video below), but Williams’ punk vocals and the staccato guitar playing give the track a welcome rock edge. Amongst the punky, gusto performances of ‘Paramore’ at large, it feels sweetly intimate. Part II features new-wave guitar lines in the verses, proving a willingness to break from the norm that permeates the album, before lurching into a typically huge chorus. Ain’t It Fun, however, marks the pinnacle not only of the album but quite possibly of the band’s whole output. Funk guitar lines dappled with pop synths, hooky chorus, hand-clap breakdown and gospel sing-along finale (“don’t go crying, to your mama”): it’s the sort of fan favourite song played at the end of a stadium tour guaranteed to leave you grinning from ear to ear. As a result the rest of the album, though still solid, doesn’t quite hit the same highs. Despite some upbeat tracks like Proof or Be Alone, the second half of the album sags with the midtempo [One of Those] Crazy Girls and ballad Hate To See Your Heart Break. And throughout the album the pop choruses are interrupted by ukulele interludes that feel unnecessary. The more you sing "I’m not angry anymore", the more it will be questioned. As a fresh start for the band, ‘Paramore’ is a massive pop success. It does have its fair share of lulls, but these are matched by some incredible highs that will undoubtedly put a smile on your face – Ain’t It Fun especially. Welcome back Williams and co. Listen: 'Paramore' is available now. Watch: Paramore are touring the States and Europe throughout the summer, info on their website.